Please note the updated scheduling information regarding the community forum for the WES principal search. 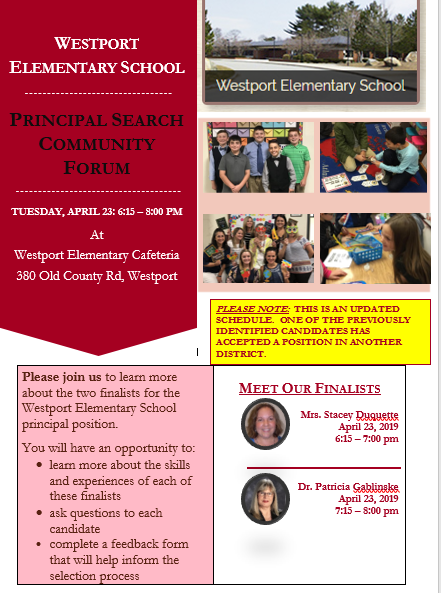 Please join us for the community forums to meet the three finalists for the Westport Elementary School Principal search. Click on the heading to learn more details about these forums. Read below to learn more about the safety drill that occurred today (March 6, 2019) in the Westport Community Schools. Today, the Westport Community Schools will be practicing our second school safety drill for the 2018-2019 school year. All Westport Community School buildings will be closed on Monday, March 4, 2019 due to inclement weather. There are no afternoon or evening activities. Good evening. The Westport Community Schools will have a two hour delay for tomorrow, February 28, 2019. The Westport Community Schools is pleased to offer our first Adult Education Program. This program will offer a variety of courses for adults in (and out) of the community to attend, including physical activities and other crafts and hobbies. To learn more about these offerings and to register, go to the adult education link found under the 'Our District' tab at the top of this page. Students at the Westport Junior Senior High School will participate in Say Something week. During this week, there will be a variety of activities to help students become empowered in school safety. This initiative was developed by family members impacted by the Sandy Hook tragedy in 2012. Attached is a parent brochure that gives more information about this program.